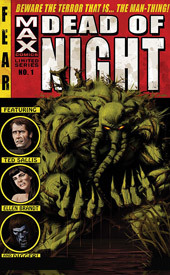 Dead of Night Featuring Man-Thing is the latest attempted relaunch of the bayou-dwelling, fear-tasting Marvel answer to the Swamp Thing. This time around, the beast has been given a horror digest flavor, in the same vein as the pulp books published during EC’s heyday. Dead of Night borrows heavily from the themes and devices introduced in The Vault of Horror and Tales From the Crypt, in more than just the style and design of the cover artwork, and there isn’t a genre more deserving of a revisitation. As a MAX title, the Man-Thing can finally break free of the stereotypical treatment he’s been given in the past and emerge as a seriously chilling creation... even if his origins are very, very similar to his DC counterpart. Writer Roberto Aguirre-Sacasa has a fairly strong grasp of the horror genre: he knows how to quickly define a cast and sway his readers’ feelings about it on a whim, and he delivers on the few instances where he’s looking for a shock. Although he occasionally goes overboard in his quest to use big words and long conversations, even those potential pitfalls are kept fairly tolerable. I didn’t like the way he tied the book into the Marvel Universe, (how many times can somebody’s origin involve an attempt to replicate the super soldier serum, anyway?) but it was at least done in an inventive way that I’d never seen before. Kano, who provides the artwork for the majority of this first issue, offers solid, stylish visuals that focus on storytelling first. Flashy art would be counterproductive in a setting like this one, where the real emphasis should be on the characters and their odd tale, and Kano seems to understand that. His work is a mixture of Tim Sale and Goran Parlov – very clean and simplistic, but also never shirking on detail. Like Parlov, he can display a gory payoff realistically, further driving home the impact of an important moment, (as he does near the end of this issue) and like Sale his characters all have a unique face, their own obvious personality. While he occasionally shows signs of being rushed, (his backdrops could use a bit more refinement, and the later pages of this issue show a sudden drop in overall quality) for the most part I enjoyed his contributions. Dead of Night is bookended by a pair of painted pages featuring “the digger,” whose introduction and conclusion to the story is in the same vein as the Cryptkeeper in Tales From the Crypt. Nick Percival is the painter of choice for these brief asides, and provides a markedly different flavor than Kano’s work in the rest of the issue. Percival’s work is grotesque, which I mean as a compliment. The Digger’s decayed skin falls from his bones, his tattered clothes look like they were last washed some time in the eighteenth century, and his entire world is cloaked in a dense fog. It’s a little cheesy, but that’s understandable in a book like this, and provides a nice respite for readers at each end of the issue.